1. Inland Chukchi: L.99-1/2"x 6-1/4"
4. Bering Sea Yuit: 60-3/4"x 4-1/4"
5. Norton Sound: 88-5/8"x 3-5/8"
6. MacKenzie River Delta: 99-1/4"x 4-5/16"
7. Copper Inuit: 86-1/2"x 5-5/8"
8. Caribou Inuit: 107-7/8"x 3-5/16"
10. Polar Greenland: 103-3/8"x 2-7/8"
11. Upernavik Greenland: 92-1/8"x 2-7/8"
13. 17th C. West Greenland: 84-3/8"x 4-5/8"
15. West Greenland (17-1800s): 86-3/8"x 3-5/8"
16. West Greenland (17-1800s): 79-7/8"x 2-7/8"
17. West Greenland 17th C.: 81-1/8"x 3-1/4"
18. East Greenland: 83-1/4"x 3-1/16"
1. 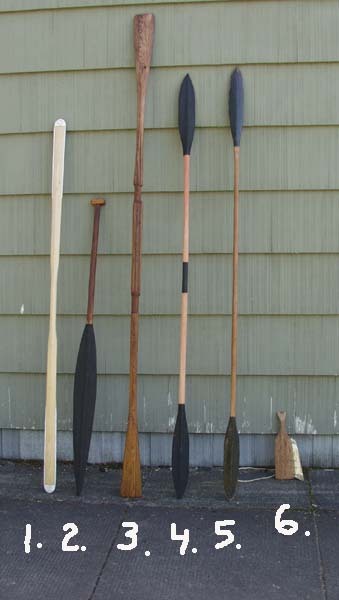 West Greenland (20th C.): L. 6'4-5/8" x 2-3/8"
2. Koniagmiut: same as no. 2 above. 3. Nattilingmiut: L. 8'4-5/8" x 4-1/2"
4. Norton Sound: same as no. 5 above. 5. Bering Straits: L. 65" x 4"
6. 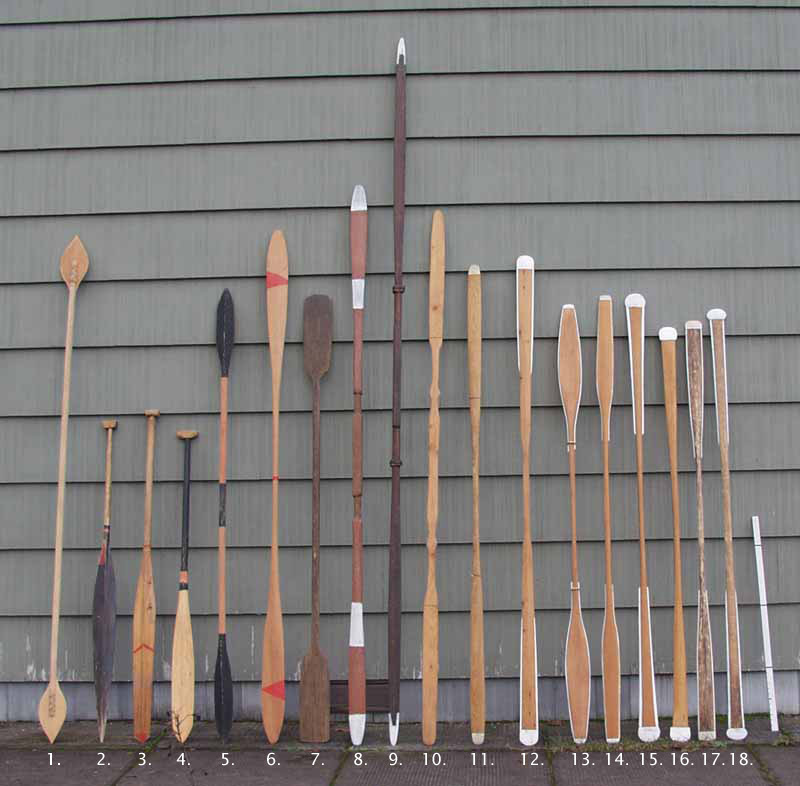 Koryak hand-paddle (1 of 2 per kayak): L. 14-1/2" x 4-7/8"
From Harvey Golden's traditionalkayaks website.